. . . at the most unlikely time and in the most unlikely place! It was one of those straight out of a film moments where you couldn't really have written the script any better. The two had just left the shopping centre and headed over to Cathedral Square after grabbing themselves a MacDonald's to eat out in the open. Cathedral Square is the open precinct area in front of the city’s Cathedral which dates from the twelfth century, It is surrounded by buildings such as banks, restaurants, a coffee shop, and a bakery etc. Over the years these buildings have frequently changed hands and served many different purposes such is the nature of an ever evolving and diverse city centre setting. As usual it was fairly crowded so they decided to go and sit on the steps by the Guildhall, a small ancient monument situated in the centre which once used to be the town’s hall. This allowed them to look back across the square. Other families were sitting on various available seats and on the walls of the flower beds, as is always the public habit. Pigeons nibbled rhythmically at the endless amount of scraps thrown to them and a small band was playing to their left, trying raise money for Thorpe Hall redevelopment. The two sat talking quietly about nothing much in particular when suddenly there was a whooshing sound. They had forgotten that they were sitting right in front of the recently installed fountain sprays - the council's latest fashion accessory to the square whereby 'walk through' fountains suddenly come on and spray water and you can choose to move out of the way or get wet! As they both looked on there was a sudden increase of wails and screams around them, they wondered just how long this latest fad would last! All but a couple of young teenage girls who enjoyed the prospect of getting wet moved swiftly out of the way. As Sam and Josh gazed deep into the watery sprays and beyond the dispersing crowd they could see hazily through to the other side of the square. It was then that their laughs and smiles changed to reactions of complete startled shock . . . Josh felt it was as if he was momentarily paralysed, as if his brain couldn't really process what he hadn't expected to see . . . he was there again, standing, looking over a newspaper right at them - at both of them. Their four eyes met his two for just a couple of seconds before the man - that same man Josh had seen many times recently, stepped back, blended into the crowd, and then was gone. “It's him,” shouted Josh as he got up like a shot and belted across the square . . .
Let me ask you a question: Have you ever wandered out of your front door and wondered what used to be there several years ago, perhaps hundreds of years ago? Have you ever thought about finding out? And the future! What might it hold for the intimate place so dear to you now? As I move around the city I often stop to ask myself this question. When I look long and hard enough, I can feel things, I see things and then stories unfold inside my mind. I am looking now, and I can see into a time far ahead many years from the present. Someone is sitting out in the open somewhere in the city, looking into a scene that lies in front of him. He doesn't need any special equipment to rediscover the past, in this distant future age our footprint can be read quite easily, such are the technological advances. I sat there a few times myself in that same place watching the little children play, the older folk walk their dogs and the youths playing football wherever they could find enough space to throw down a few jumpers. So much has happened here, so many people have passed through. I am reminded of the summertime as nearly always it was then that I visited. Ah! those warm summer evenings, I remember them well with affection. But what of time? What of the past, our present, and the future? As I peer further into that window of a time not yet upon us, I see the man is puzzled, in fact he is calling a friend over and pointing to a park bench that stands forty metres or so in front of him. He says something doesn't make sense and that he is seeing two things similar, but not exactly the same, and yet . . . they are occurring as one! I will say to you now as I have always said, time is as one. What we do with our lives, what we feel and experience leaves a footprint for others to discover, but sometimes, just sometimes someone has got there first. Someone else has perhaps already seen who we are, what we are doing and knows that we are drawn to tread in that same footprint and follow that same path that has gone before us. When we do this, things don't always turn out the way we expect. He cannot see me, but I gaze with the man who sits staring at a bench, and in the intensity of the moment I can see what he sees. A story that starts and finishes in this very place. Two teenagers who decided to seize the moment were rewarded with a very strange experience one summer evening not far from the present. This is the story that needs to be told. Come with me now to Peterborough town park, one warm evening in July. “Of course, not everything about the past is straightforward here in Castor.” His voice held a note of hesitation as if to expect a reaction. He looked up at the four adults who were listening to him intently. “There are some things that we can't always explain,” he said, raising the glass of liquid gold to his lips. “Oh, like what?” asked Beth. “Well, let's see now . . .” George hesitated as if he might have a tantalising collection of tales to tell and he couldn't quite make up his mind which one to tempt them with. “There is a story you should hear . . .” he began “. . . of a man who was last seen in these parts many years ago on the evening that he died, and some do say that you can see him again trying to make his way home for the very last time. To understand the roots of this story we have to go some twenty miles south of here to a village in Huntingdonshire. A young man back in the early Victorian days left his roots and ran away to Peterborough. Nobody really knew of what descent he was or why he felt the need to come to the City, but one thing that was clear is that he was capable of walking and running all day if he had to. Folks do say that, although he apparently lacked a great deal up top, he was quite an athlete, tall and lean, he would win any sporting challenge that came his way. It was said that his party trick was to catch rabbits in the cathedral precincts with his bare hands! Well, as legend has it, one day in early summer he came up this way and as often he liked to do, he spent the day roaming The Hanglands and Ailsworth Heath to the north of here. As he realised dusk was approaching, he headed back and, not afraid to make up lost time if he had to, he would frequently break into a run. He would have had to make his way back through these parts to get across to Milton Ferry bridge which is just a little less than a mile east of where we sat now. From there he would have crossed the river but, as dusk was drawing in fast, he decided to take a short cut through the meadows. That would mean he'd need to cross the river again approaching the flood meadows between Orton Waterville and Orton Longueville. The others looked at each other, there was no doubting anything of what George was telling them, he spoke with certainty about everything he said. “Have you ever seen him?” asked Beth a little cautiously. George looked again into his glass, took a final swig of the warm beer, looked up and smiled. “Me? Well, I don't really know, maybe!” he replied. This seemed a strange answer to Beth but she didn't get a chance to question him further before her husband intervened. “We saw someone.” Everybody looked at Joseph who was looking at his other half for expected support. Beth knew what was coming and she felt a little uneasy. “Didn't we Beth, last week down Mill Lane!” exclaimed Joseph. “Oh!' George remarked, quite interested. Joseph continued the story of the previous week's experiences and explained how he had seen the girl fade away as she ran down the track calling to him. Everyone was quite speechless. “Ooh!” said Sarah with a shudder, that's just so creepy. “You do believe me don't you?” asked Joseph eagerly. Joseph paused. He wasn't really sure, he hadn't looked up again. Joseph hadn't taken any notice of the other apparition but it was starting to dawn on them all that there might be some significance in there being two. For whatever reason, George was very interested and this somehow was of some comfort to Joseph. Silence fell throughout the room, it was as if nobody wanted to let their true feelings out right now, these were certainly strange stories but they had all actually happened, and now Joseph and Beth at least were beginning to really wonder just what they might mean. George gazed out onto the garden, he looked a little sad. The lines of definition in his craggy face of nearly eighty odd years told a story but, as Beth looked at him, she was not quite sure of what. Did he know more? Did he have a secret or was he just as puzzled as they were? “When our loved ones die we must keep them close,” he said. “We can talk about spirits all we like, read into the tales what we want, but the real thing that matters is our memories of those we've loved.” He gazed out into the late afternoon sunshine towards the once orchard that lay at the end of Joseph and Beth's garden as if he was remembering happier times. “This place,” he said, “this whole area . . . things happen, things have happened, but time is timeless - forged together as one!” . . .
. . . Five minutes later Neil's phone vibrated once more. This time he had to react. He texted back a quick reply to the message he'd just received and called up to Judy that he was going out for a bit. Judy heard his call and responded with just a little tinge of concern in her voice. It had been a stressful few days, the baby was due any time and she couldn't help feeling that her partner's mind was not fully in gear and ready for the imminent change their lives were about to experience. He'd gone out. How long would he be? Anyone's guess! Hadn't some of his mates gone to the football match this evening? She hoped he wasn't going to meet them and come back in stupidly late. She found herself recalling the last time he'd gone out for an evening on the spur of the moment and how it had led to a drunken parade through the Cathedral precincts late at night. She turned to face the bedside clock, it was only twenty past nine, it might be hours before he was back for all she knew. Suddenly she wasn't tired at all, she was just bothered by something, but she couldn't put her finger on exactly what. All that had actually happened was that she'd decided to have an early night and Neil had decided to go out. What was wrong with that? Well, what was wrong was that Judy didn't want to be alone right now, her baby was almost ready to drop and she felt very on edge, so she texted her friend who was more than happy to come over and keep her company for the rest of the evening. If the truth be known, Nasra Chowdry was just as anxious. There were a lot of unanswered questions for her too and when Judy called 'lonely' it was actually something she wanted to hear. The lights of the oncoming traffic flowed past her as her mind allowed their imagery to drift into her subconscious. As she drove the short journey across to Bretton she found she couldn't help those dreams replaying over and over in her mind. She headed northwards, her mind only partly on the task in hand. As headlights continued to dazzle her she became aware she was passing a wooded area and suddenly again she remembered walking in a woods, a long time ago gathering plants – looking for something - finding something -? She wasn't quite sure. Brightness flickered all around her, no longer just the beacon of oncoming traffic. Now there was rain in the air too. She turned on the wipers and, in what seemed like no time at all, it was like watching an old movie, with the strobe-like effect of the car headlights dazzling through the intermittently partially clear windscreen simulating the archaic footage - as if being projected all around - just for her! Suddenly she became alert, as through the flickers, she could see a figure standing motionless. As she instinctively slowed she could see who it was, but surely not! This couldn't be! “Neil?” She stopped and wound down the window, immediately realising that the rain and wind had now grown much stronger. He just looked straight ahead. “Get in, I'll run you back home.” she said, it being the obvious course of action as his home was actually where she was heading anyway. He climbed into the passenger's seat still looking blankly straight in front. Nasra became immediately somewhat uneasy. What on earth was he doing here? She glanced across at the bedraggled figure, not really sure what to say next. “What are you doing out here then?” He didn't reply. Nasra paused for a moment then tried again. “Look, if something's the matter I'm sure we can sort it out.” She looked away from the wheel across at Neil. His face was pale and expressionless as if he'd had a complete breakdown. Quickly she was forced to refocus her attention on the road in front as she tightened her grip on the steering wheel. Sweat oozed from every gland as a shudder ran down her spine. Where was she going? Her mind was now locked into a memory battle she couldn't win. For a second or two she couldn't remember anything. Where was she even heading? There was only a second or two to dwell on this before something else caught her attention - the car was accelerating and they were heading towards the roundabout! “What the . . .” Nasra couldn't get the words out, every drop of her concentration was now being sapped by the demands of what lay in front of her. She was forced to take the roundabout at high speed. There was nothing coming but she certainly wouldn't have been able to stop if there had been! Now they were nearly at the slip road onto the A47. 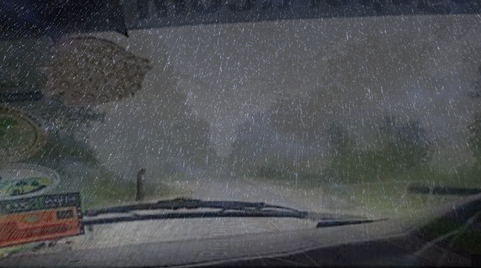 Rain was beating down, the groaning wipers were doing their best but it seemed that she had no control over her vehicle. “Neil . . Neil!” she shrieked. He didn't speak. He sat there looking vacantly straight ahead through the windscreen. Then she realised that his coat was unusually long and thick, with the hood erect and covering his entire head. It made him look quite odd, she'd never seen him like this before. Her Nissan Micra screamed down the parkway overtaking anything in its path. The vehicle was shaking, and so was Nasra. She could see the next major roundabout fast approaching as she gasped for breath. The car was not slowing down. Nasra screamed, the lights of another vehicle on the roundabout were almost upon her. Instinctively she shut her eyes and her hands left the wheel to protect her face as the tyres screeched and then . . . suddenly . . . everywhere was black . . .